I was recently asked to review a concept that was discussed at the Functional Anatomic Palpation Systems™ SPINE seminar regarding the Ligamentum Nuchae. At the seminar we review palpation and assessment, as well as discuss the clinical importance of this frequently ignored soft tissue structure….this of course is followed up in the Functional Range Release™ soft tissue SPINE seminar where treatment of this ligament is taught. Unfortunately (mostly for patients) the last time the ligament was considered for most manual practitioners was during anatomy class. 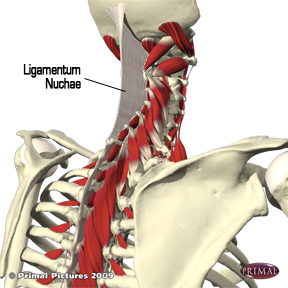 The ligamentum nuchae is a dense, bilaminar, triangular midline fibroelastic intermuscular septum. It extends from the external occipital protuberance to the spine of C7 and attaches to the median part of the external occipital crest, the posterior tubercle of C1 and the medial aspect of the cervical bifid spines. Distinct from the supraspinous and interspinous ligaments, the ligament is formed primarily from the aponeurotic attachments of the adjacent and subjacent cervical musculature. From superficial to deep, these muscles are the trapezius, rhomboid minor, splenius capitus, and the serratus posterior superior. Also of anatomical, and perhaps clinical importance, the ligament has been found to have direct fibrous attachments with the spinal dura between the occiput and C1, and between C1 and C2.1 This last point is of particular interest for those who commonly treat cervically related head pain due to the fact that although most of the cranial dura is innervated by the trigeminarl nerve (CN V), the infratentorial portion is innervated by upper cervical nerves. ….also read on the Trigemino-cervical nucleus caudalis in the spinal gray matter of the spinal cord and its possible relation to head pain symptoms from the neck area. As well as: Alix ME, Bates D. A proposed etiology of Cerivicogenic Headache: The Neurophysiologic Basis and Anatomic Relationship between the Dura Mater and the Rectus Capitus Posterior Minor Muscle. JMPT 1999; 22(8): 534-539. Getting back to the topic…the Ligamentum Nuchae should be assessed and treated for several reasons. In terms of overt injury, the ligament can, and often does become injured during motor vehicle accidents where the ‘whiplash’ mechanism has taken place. In hyperflexion (>10 degrees from the vertical), the cervical interspinous ligaments, which blend with the Ligamentum Nuchae, are extended to their maximum physiologic range and are vulnerable to tears. Lack of treatment directed at the structure can result in healing with a predominance of restrictive fibrosis, which can lead to persistent pain and flexion restriction (the ligament is one of the main Functional Range Synergists for cervical flexion as outlined in the Functional Range Release™ soft tissue therapy system). In addition to this, due to the fact that the structure provides attachment for various other structures, the effect on the movement and biomechanics of the cervical spine are far spread. In terms of non-acute pain in the cervical spine, connective tissue contraction surrounding the ligament can lead to restricted movement in forward flexion and rotation, which can persist even after release of the surrounding musculature has taken place. Such contraction may occur due to posturally related mechanisms, for example habitual postures involving increased cervical lordosis (as is often seen in the common ‘upper cross posture’) which maintains the structure in a shortened position; or due to prolonged tension/stress as would occur for example with aberrant sleep posture. The latter can occur in back sleepers using a large pillow maintaining the head in flexion. 1. Dean, N.A. and B.S. Mitchell 2002. Anatomic relation between the nuchal ligament (ligamentum nuchae) and the spinal dura mater in the craniocervical region. Clin. Anat. 15:182-185.